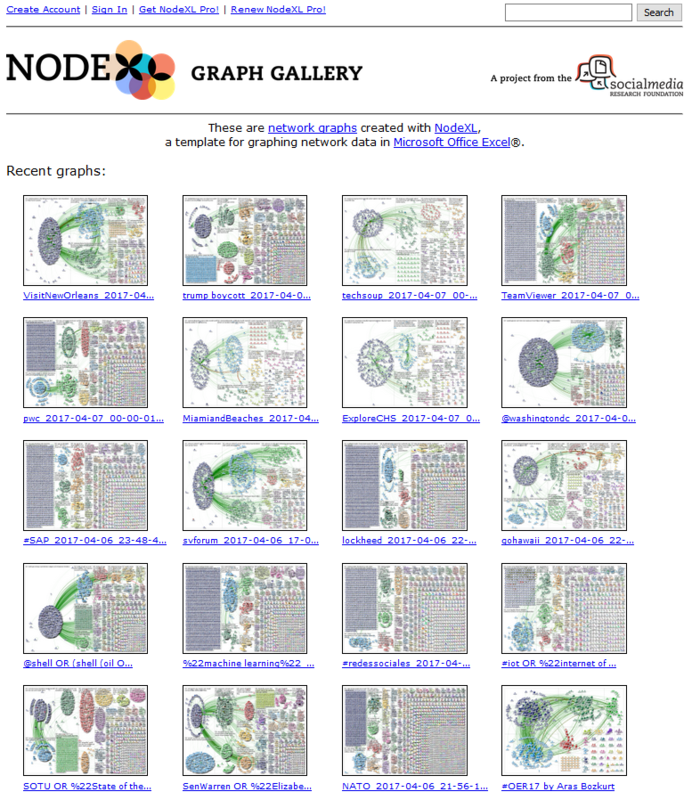 Visit the NodeXL Graph Gallery, where our community has published more than 80,000 network maps on a vast variety of topics from various data sources. The network reports in the gallery summarize the most important information created with a NodeXL workbook which include top influencer, hashtags, URLs, words, word pairs and more. You can download many of the NodeXL workbooks at the bottom of each page, as well as the options files used to create the respective analysis. These data recipes will help you to easily map your own networks with just a few clicks. NodeXL Graph Gallery also offers a direct marketing interface to support your Twitter networking strategies. Watch out for the “Smart Tweet” buttons in each report which are draft tweets that help you to directly engage with key influencers by sending them customized messages on Twitter. When published on the web to the NodeXL Graph Gallery, NodeXL network reports provide an easy to share package of information about each topic. Each NodeXL Graph Gallery web report is composed of multiple segments. As you scroll down on the page, a shortcut menu will pop up as seen on the left. Network Visualization: The network map at the top of the page. Description: Summary of the data source, time of data collection and the time span of the data set. Data File: Download the Excel workbook containing the full dataset and the options file (depends on the author’s upload settings).